Information is an essential part of our life. It should be vary according to various categories related to us. Latest updates, coverage and media have provided us all what we want. When it comes to our knowledge and quality we want that true information is a must. There are various different categories related to our life which are essential for us. We always want to be updated by getting information about electronics, mobiles, automobiles, jewellery, garments, fashion and cameras etc. SAG Mart, India’s leading information portal brings its various categories related to real world. Keep yourself updated by getting new information in just few clicks. It serves you with required knowledge regarding a particular brand and its respective products. Today, use of mobile phones is becoming the most essential part of our life. Here on SAG Mart you can find the details of various latest, launched and upcoming mobiles of top companies. Mobile category serves you with details of top mobile brands like Samsung, Sony, Nokia, Micromax, LG and HTC etc. Read the full specifications, approx price along with brief introduction of the handset which is selected. 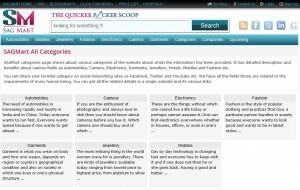 You can also find the latest news of related category. In the automobiles section you can get to know about latest and upcoming launches of luxury automobiles, commercial vehicles, SUVs, MUVs, hatchbacks, bikes and scooters etc. SAG Mart understands your basic requirements so we are also providing specifications and price of the automobile you search. Everyone has his own style stamen and sense of fashion. 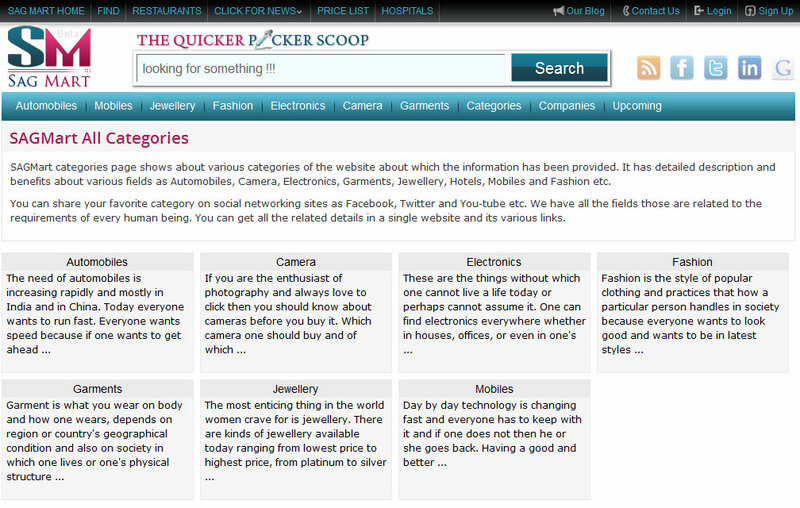 So this category keeps you up to date with latest fashion accessories, watches, fashion related products and much more. Same as this clothing or garments, and jewellery are also very important categories about which we generally think. Electronics items are another important thing we consider whenever we think of technology. SAG Mart Electronics category provides information about various electronic products as refrigerators, laptops and computers etc. These products are from global companies as Samsung, Apple, Lenovo, Acer and Huawei etc. So here on our portal SAG Mart you can get various categories and their related products in a well managed manner.